Today’s post is an interesting contrast in how things that shouldn’t work sometimes do, and how things that could work sometimes don’t. There’s all kinds of bizarre things happening with this logotype, but I must say the overall effect is quite beautiful and engaging. The colors are nice, too. The simplicity of the Top packaging and logo seems like something I would like. The slightly retro illustration of the top, too, is close to being OK. But ultimately it just feels cheap and off-target. 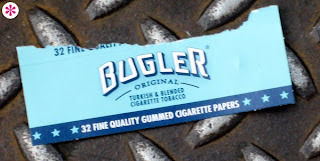 Thanks to P*S* Reader Jon Custer for suggesting rolling tobacco ages ago. Finally found the right things to show.